We kick off the week with a British documentary from Karen Guthrie and Nina Pope about Jaywick, a small coastal town 80 miles east of London and officially now England’s most deprived place. 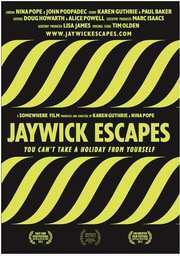 Arriving courtesy of A Somewhere Film, the feature Jaywick Escapes has a runtime of 48 minutes, whilst the recommended retail price will be £15. Nick is a reformed East End wide boy who, recently widowed and free from years of addiction, moves to Jaywick to start a new life. Before long, his demons catch up with him and he struggles to stay afloat. John and Sara are a chaotic young couple whose lives lurch from thrills to lows. Eventually we discover the formative hardships of their lives, which, set against their sporadic efforts to take control, typify the cycle of misfortune that plagues so many in the town. Mac is the philosophical local paper-boy, an orphan who invites us to consider the fate of the young growing up in this troubled place. Intimate scenes of the lives lived in Jaywick’s seaside shacks are contrasted with exquisitely shot footage of the townscape, an homage to British DIY ingenuity despite its decay. Moments of humour are revealed in scenes of Barry, a laconic psychic whose ghost-hunts reveal little apart from his blind optimism; and of Jaywick’s colourful annual summer fair – where absolutely anything goes. As this film winds in its taut narrative strands, what becomes apparent is that this once beloved resort of London’s Eastenders is now a truly broken society, with Rachman-esque rental and benefit squalor courtesy of an ineffectual and disinterested State, whose only regular presence in the town are the cursory sweeps of the local Police force. Genteel pensioners are cheek-by-jowl with skittish and volatile youths; those who came for tranquillity, struggle alongside those who can no longer afford or survive the urban spaces they’ve left. Throughout this, Jaywick and its skies and seas have a mesmerising effect that makes it impossible not to warm to the place, whilst profoundly pitying its situation and that of its residents. Here holidays from the past collide with the present.